I can’t remember what made me start writing an “awards show” list about each family vacation we take, but it is one of my favorite traditions now. Not only is it a handy way to summarize a trip, writing the list together has become the way we say “good-bye” to our vacation and get ready to transition back to our regular lives. My husband is from New Zealand, which means that I have many wonderful New Zealand vacation memories. However, once our kids started school, we realized that the fact that we live in the Northern Hemisphere while his family all live in the Southern Hemisphere means that a fair number of our summer vacations would actually be winter vacations – we head south once school is out for the summer… and arrive to cold and rain (and wind, because his family live in Wellington). So our kids tend to think of New Zealand as a cold, rainy place. This year, we wanted to fix that, and also to let my in-laws have all of their grandkids around them at Christmas. So we flew down to New Zealand for Christmas. If you are not constrained by school holiday schedules, I would NOT recommend doing this. Lots of Kiwis fly home for Christmas, making the flights much more expensive and harder to book than usual and also January is when most New Zealanders take their vacations (it is when school is out for summer!) and so some places will be more crowded than usual. Wait until February and you’ll still get great weather, but fewer local tourists. 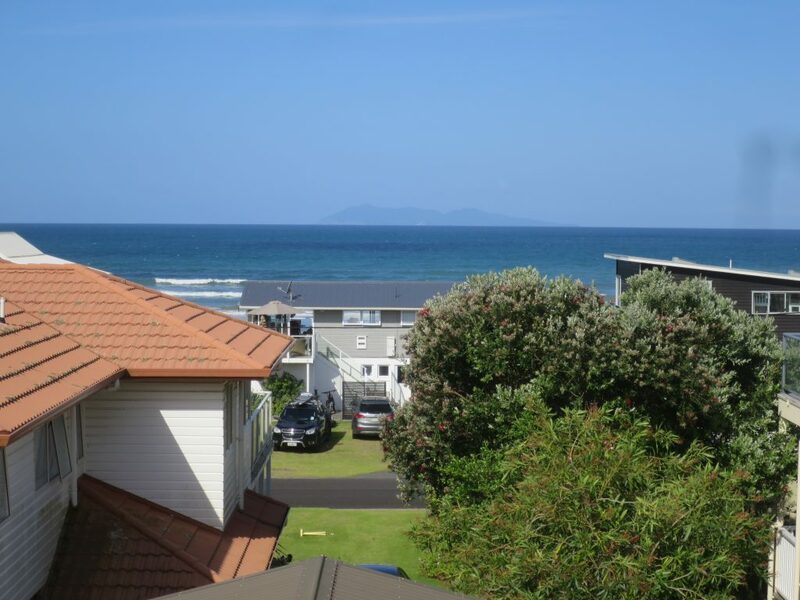 The grown ups say it was the beach house in Waihi beach, hands down. We were two blocks from the beach and here was the view from the balcony. Enough said. 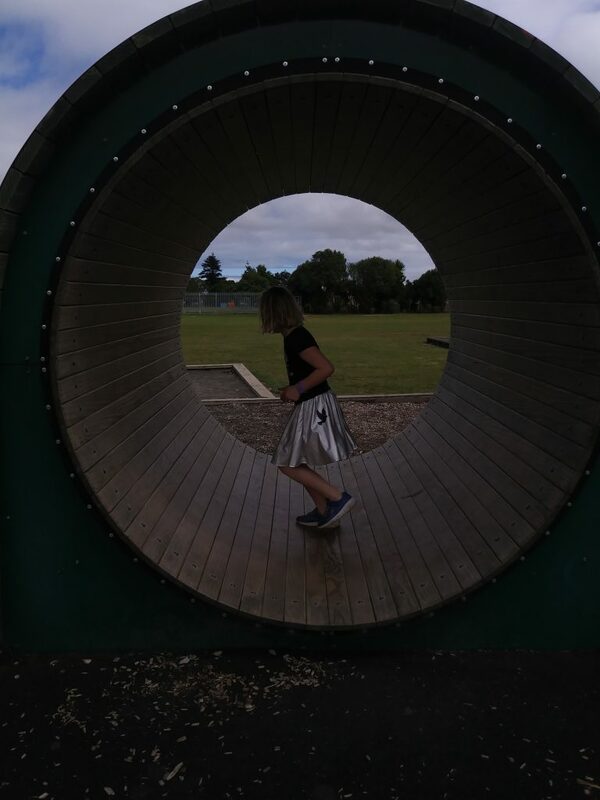 My nine-year-old says it was our hotel in Rotorua, for “the amenities” (a trampoline, a swimming pool, and a private hot tub that was heated by geothermal activity – we stayed at Aura Accommodation, and she’s right: it was very nice). My eleven-year-old says her grandparents’ house. Awwww. The nine-year-old says “tractor ride!” which was really a ride in a trailer pulled behind a large ride-on lawn mower on our friends’ lifestyle farm outside of Auckland. Our lack of consensus continues. My husband liked a “breakfast salad” (portobello mushrooms, rocket (arugula), and beetroot surrounded by a ring of cauliflower puree and topped with toasted cauliflower crumbs and a poached egg) that he had at The Corner Kitchen and Bar in Clevedon, which was on our way to Auckland. That is most definitely not my thing. I liked the kumara (sweet potato) and blue cheese soup I had at the Waikino Station Cafe. We stopped in after a hike in the Karangahake Gorge, and the soup was delicious – as was the caramel slice I had for dessert. My nine-year-old chooses Cicio Cacio, an Italian restaurant in Wellington where we celebrated my mother-in-law’s birthday. She chooses it in part for the freshly made gnocchi but mostly for the delicious chocolate gelato she had for dessert and rated 7/5 on her NZ chocolate ice cream rating scale. My eleven-year-old says the best meal we had was the BBQ we had with friends at a park the night before we left. She chooses it entirely based on the individual pavlovas that one of our friends made for dessert. Since we’re talking treats… the pavlovas were the eleven-year-old’s favorite and chocolate ice cream was the nine-year-old’s favorite. My husband picks Tip Top’s new kiwifruit and pavlova flavor ice cream. And I can’t decide between caramel slices and hokey pokey ice cream. Finally, a unanimous decision! The competition for this category was intense, but we all agree that the best playground we visited was the Levin Adventure Park. We stopped there for a break on our way to Rotorua, and it is an excellent playground. It had a flying fox (zipline), two “hamster wheels”, a roctopus, a good tunnel slide, and more. All of my kids’ Kiwi playground favorites. We all bought souvenirs, of course. My favorite find was some new earrings at Pauanesia, which is my favorite store for souvenirs in Auckland. My eleven-year-old picks her kakapo pillow case, also found at Pauanesia (she LOVES kakapos). My nine-year-old says her best souvenir is a fluffy lamb purse she bought, and my husband says it is his new Maori All Blacks jersey. I love planning vacations, looking at all the possible things we might do and coming up with a plan to see great things. But every vacation also has unexpected treats, too – things we found on the fly and ended up loving. My favorite of those on this trip was the walk we did in Smith’s Bush, which was just a 20 minute walk from our hotel in Auckland. It is a shady walk on a boardwalk through a surviving patch of native forest. The boardwalk protects the native trees, and also makes it easier to spend your time looking up at the glorious canopy above you. My husband also picked an outing with trees – the canopy walk in Rotorua. We stopped in Rotorua to show the kids the geothermal activity and some Maori culture. The canopy walk was recommended by our hotel, and it was definitely cool. The kids both pick the “tractor ride” mentioned above. That’s the award show wrap up of our trip. 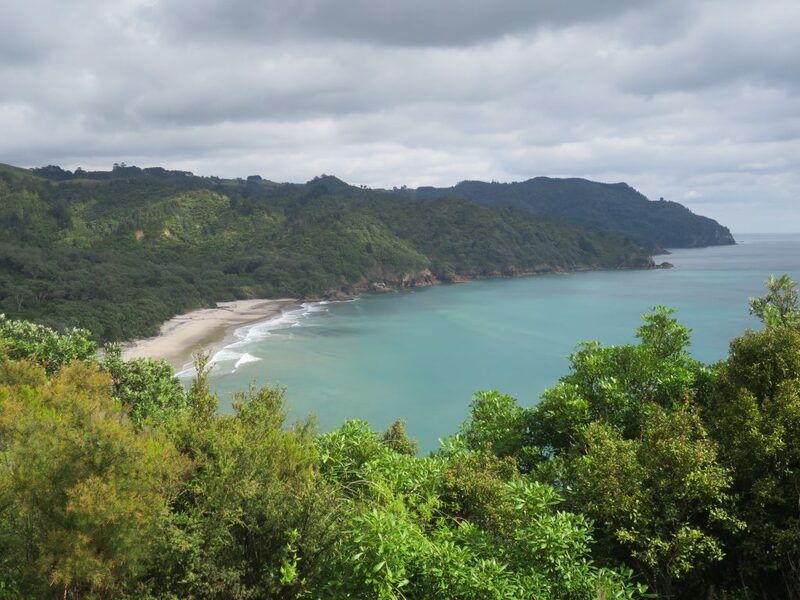 I’ll have a lot more to say about our planned excursions – hikes, beach time, a visit to a gannet colony, and more – when I write a proper itinerary post. All content copyright Adjusted Latitudes. Do not use without permission.